Thanks for sharing this Mike. I will definitely check out our daughter's work. 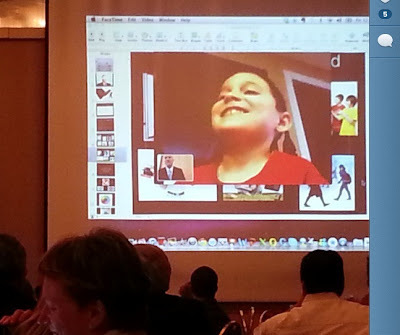 I was just telling someone today that some of the most interesting people in the edu world have been involving their kids/collaborating with them... for instance Wes Fryer, Brad Flickinger, and Kevin Honeycutt just to quickly name a few. :) thanks for sharing your story... I think we are slowly able to think and act more on the fly thanks to being so connected and I think it's making things more interesting! Wow what an interesting story! I would be inspired by a key note lecturer if they used live children to get a point across! May I take this opportunity to share with you my 'creative' displays to see what an fellow teaching colleague over the pond thinks of my displays?! I would be intrigued to see what displays look like in your classrooms. What a great idea! What I loved about this just as much is that you modeled what it means to be a learning principal. You not only talked about it, you demonstrated it through your son's eyes. Although you may have been nervous, I have to imagine that your energy level was at an all time high. You should be a very proud dad for many reasons as well as your son should be of his dad. And that should just warm your heart to the "nth" degree. Brilliant my friend! Thanks so much for sharing this Eric. Not only was it a learning experience for those attending the workshop it is a great idea for other leaders to use with their staff. Another reason I am glad I follow your blog. This is a great way to show the importance of student choice and how letting them become creative can be such a powerful learning experience. I agree with Jimmy, you should be very proud of your son, but I am also proud of you for being willing to take the risk andshare his learning and creativity with us. Thanks all! My son was actually irritated that the Internet connection in CA was not up to speed as he had so much more he wanted to say. I shared this post with his principal and he is now going to be involved in a game pilot that was for 4th grade and higher.